This week’s guest is drummer Billy Hart. You can see him as part of the 2019 Winter Jazz Fest at Le Poisson Rouge on January 12 and he’ll be at Dizzy’s Club with The Cookers the last week of January. We have more festival details coming at the bottom of the segment, but before that we have more listings for you this week. Pianist Barry Harris leads a trio at Dizzy’s Club on December 24. Pianist David Virelles is at the Village Vanguard with Chris Potter from December 25-31. Jake Meginsky’s documentary film Milford Graves Full Mantis is showing at Time and Space Limited in Hudson NY through January 1. See our review for more details on the film. Pianist Marc Cary’s Harlem Sessions series continues with a switch to late Friday night sets at Smoke on December 28 and January 4. Pianist Harold Mabern leads a quartet at Smoke to celebrate the release of his Iron Man album from December 27 to January 2. Bassist Alex Blake is at Harlem’s Greater Calvary Baptist Church with Jay Rodriguez for a lunchtime set as part of the Harlem Jazz Boxxx series on December 28. Trombonist and seashellist Steve Turre is at Jazz Forum Arts in Tarrytown NY on December 28 and 29. Guitarist Nels Cline is at Sony Hall in Manhattan on December 29. Tubist Joe Daley is at Terra Blues with Hazmat Modine on January 5 and 19. Vocalist Catherine Russell is at City Winery on January 7 and the Mohonk Mountain House in new Paltz NY for Jazz on the Mountain from January 12-14. Drummer Andrew Cyrille is at the Zürcher Gallery for a solo performance on January 9. 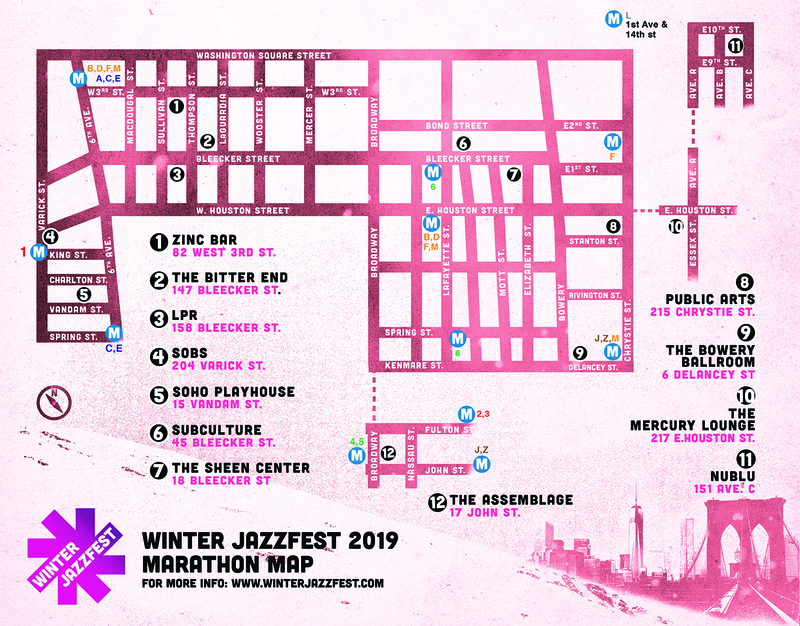 The 2019 Winter Jazz Fest blows back into town from January 4-12 and the full schedule’s been announced! Shows are scheduled at various venues in downtown Manhattan with marathon nights of music on the 5, 11, and 12 and individual events and talks on other nights. Look for our usual on-air programming in our upcoming shows and right here–with our annual Cheat Sheet preview and more. The mini marathon night on January 5 will have the Zig Zag Power Trio with Melvin Gibbs and Will Calhoun at The Bitter End, bassist Richard Bona at Le Poisson Rouge, Tia Fuller at Zinc Bar, and Nels Cline at Nublu among many other acts. You can see the full schedule at the Winter Jazz Fest website. Save the date(s): the 2019 Vision Fest will honor former Suga’ guest Andrew Cyrille and returns to Roulette in downtown Brooklyn from June 11-16. Full lineups will be announced later and we’ll get you details and full coverage as the date nears and the weather warms up. That’s all for now. Suga’ in My Bowl will be back on WBAI‘s airwaves on Sunday January 6. We also have a schedule change and will be moving to a weekly Tuesday night schedule at 10 PM starting January 8. We’ll also have another edition of “On the Bandstand” online next Sunday with a fresh set of listings. We’re off again this week, but back next week with a new show with drummer Billy Hart! WBAI Radio’s also wrapping up it’s December mini fund drive today and we’d appreciate donations in our name. Remember, all proceeds go to keep the station on the air, not to us. Until next week, head over to our archives, where you can listen to nearly a decade of previous shows. And we have more listings for you this week. Pianist Marc Cary’s Harlem Sessions series continues with late Saturday night sets at Smoke on December 15 and 22. Pianist Harold Mabern leads a trio at Smalls in a late set on December 19. Guitarist Bill Frisell is at Roulette on December 20. Pianist Barry Harris leads a trio at Dizzy’s Club from December 21-24. Pianist David Virelles is at the Jazz Gallery for a tribute to the late Roy Hargrove on December 22 and at the Village Vanguard with Chris Potter from December 25-31. Tubist Joe Daley is at Terra Blues with Hazmat Modine on on January 5. Looking further into the future the full schedule’s been announced for the 2019 Winter Jazz Fest, which returns from January 4-12! Look for our usual on-air programming in our upcoming shows and right here–with our annual Cheat Sheet preview and more. That’s all for now. Suga’ in My Bowl will be back on WBAI‘s airwaves on Sunday December 23. We’ll also have another edition of “On the Bandstand” online next Sunday with a fresh set of listings. We’re pre-empted this week for WBAI’s December mini fund drive, but if you missed our last show with drummer Leon Parker, head over to our archives, where you can listen to that and nearly a decade of previous shows. And we have more listings for you this week. Drummer Bobby Sanabria and trombonist/seashellist Steve Turre team up for a performance of A Jazz Nativity on December 16 to lead the Multiverse Big Band in West Side Story Reimagined. This week’s guest is drummer Leon Parker. You can see him at the Jazz Gallery with Dan Tepfer on November 27 and in a run at the Jazz Standard with Aaron Goldberg’s trio from November 29-December 2. And we have more listings for you this week. Saxophonist David Murray is at the National Jazz Museum in Harlem for a talk on November 27. Guitarist Nels Cline and Drummer Andrew Cyrille are at The Stone in different ensembles on November 27. Guitarist Mary Halvorson is at the Jazz Gallery with Gabriel Zucker on November 28. Guitarist Julian Lage is at Williamsburg Music Hall on November 29. Vocalist Catherine Russell is at Jazz Forum Arts in Tarrytown NY on November 30 and December 1. Pianist Marc Cary’s at Mezzrow with Ron Blake on November 29 and his Harlem Sessions series continues with late Saturday night sets at Smoke on December 1 and 8. Tubist Joe Daley is at Terra Blues with Hazmat Modine on on December 1 and 15. That’s all for now. Suga’ in My Bowl will be back on WBAI‘s airwaves on Sunday December 9. We’ll also have another edition of “On the Bandstand” online next Sunday with a fresh set of listings. We’re off this week, but if you missed last week’s show with trumpeter Eddie Henderson, head on over to our archives, where you can hear that and nearly a decade of previous shows. Pianist Harold Mabern leads a trio at Smalls on November 21. Pianist Marc Cary’s at Mezzrow with Ron Blake on November 29 and his Harlem Sessions series continues with late Saturday night sets at Smoke on November 24 and December 1. We’re off the air this week, but will be back with a new show next Sunday. Until then, if you missed last week’s show with trumpeter Terence Blanchard, hop on over to our archives where you can hear that and nearly a decade of previous shows. Pianist Billy Childs is at the Schomburg Library on October 22. Saxophonist Ravi Coltrane is at the Village Vanguard from October 23-28. Bassist Ron Carter is at Birdland from October 23-27 with a quartet; and October 30-November 2 with his Golden Striker Trio. Pianist Harold Mabern leads a trio at Smalls on October 24. Vocalist Catherine Russell is at the Beacon Theater with Steely Dan on October 24, 27, 29, and 30. Drummer JT Lewis is at the Jazz Gallery on October 26 with Brandon Ross. Guitarist Mary Halvorson is at the Greenwich Music House on October 25, and at The Stone on October 26. Pianist Vijay Iyer is at Bard College’s Fisher Center for the Performing Arts in Annandale-on-Hudson NY on October 26. Pianist Marc Cary’s Harlem Sessions series continues with late Saturday night sets at Smoke on October 27 and November 3. Bassist Christian McBride is at the National Jazz Museum in Harlem for a talk on November 1. He’ll also be leading a big band for an evening of Latin Jazz at Newark’s NJPAC on November 9. Trumpeter Ahmed Abdullah leads the DIASPORA ensemble at Brooklyn’s Sistas’ Place on November 3. Tubist Joe Daley is at Terra Blues with Hazmat Modine on November 3 and 17. Saxophonist James Brandon Lewis is at the Clemente Soto Velez Center on November 4 for a free afternoon performance as part of Arts for Arts’ Sunday afternoon series. Poets Abiodun Oyewole and Felipe Luciano are at the Apollo Theater on November 5 for a conversation about the origins and impact of The Last Poets. That’s all for now. Suga’ in My Bowl will be back on WBAI‘s airwaves on Sunday October 28. We’ll also have another edition of “On the Bandstand” online next Sunday with a fresh set of listings. This week’s guest is filmmaker Melissa Haizlip, director of the documentary Mr. SOUL! Ellis Haizlip and the Birth of Black Power TV. There will be screenings at the Urbanworld Film Festival on September 21 and the Reel Sisters of the African Diaspora Film Festival on October 6 and the director will be at both screenings for question and answer sessions. And we have more listings for you this week. Trombonist/seashellist Steve Turre leads a quintet at Smoke for a CD release party on September 21-22. Saxophonist Lakecia Benjamin is at Dizzy’s Club from September 21-23 with Ulysses Owens’s big band. Blues vocalist Alexis P. Suter is in downtown Washington NJ for a free outdoor concert on September 22. Pianist Marc Cary’s Harlem Sessions series continues with late Saturday night sets at Smoke on September 22 and 29. Vocalist Fay Victor is at 55 Bar on September 27. Guitarist Pat Metheny, bassist Linda May Han Oh, and drummer Antonio Sanchez are at CT’s Ridgefield Playhouse on September 27; Morristown NJ’s Mayo Performing Arts Center on September 28; and LI’s Staller Center for the Arts in Stony Brook on September 29. Tubist Joe Daley is at Terra Blues with Hazmat Modine on September 29 and October 13. Trumpeter Adam O’Farrill is at the Jazz Gallery on September 29. Vocalist Jazzmeia Horn is at Hartford CT’s The Artist’s Collective on September 29. Saxophonist Claire Daly leads a quartet at Jazz Forum Arts in Tarrytown NY on September 30. Vocalist Andy Bey is at the Blue Note on September 30. Vocalist Dee Dee Bridgewater is at Birdland from October 2-6. Pianist Vijay Iyer is at Columbia University’s Miller Theater on October 20. Vision Fest promoters Arts for Art presents their inGardens series of free outdoor concerts in Lower East Side neighborhood gardens on weekends through September 30. Bassist William Parker is At the 6BC Botanical Garden on E 6 St in Manhattan on September 22 and at First Street Green on E 1st St in Manhattan on September 29. Saxophonist James Brandon Lewis is at First Street Green on September 23 and Vocalist Fay Victor closes out the series at First Street Green on September 30. See the full schedule at the Arts for Arts website. That’s all for now. Suga’ in My Bowl will be back on WBAI‘s airwaves on Sunday September 30 We’ll also have another edition of “On the Bandstand” online next Sunday with a fresh set of listings.